Brannskjær Park will be built on Oslo’s most exciting and important post-industrial waterfront site, Filipstad, and will be by far the largest publically accessible open space within the Fjord City Plan. LINK Landskap’s sketch plan for this significant new public park will be used by the site’s owner, The Port Authority (Oslo Havn KF), to illustrate their aims and ambitions for the site and as a basis for future design development. The original landscape character of the area is reflected in the park’s name, Brannskjær Park. The word ‘Brannskjær’ describes a series of rocky outcrops, or islets, off the coast of Philipstad (known today as: Filipstad). These rocky outcrops were buried as part of an extension of the port facilities in the mid-19th Century. Filipstad has an important industrial history as one of Norway’s most important hubs for the import of groceries. It also has a history of recreational use, with sea baths and diving towers located in the area. LINK Landskap’s proposal for Brannskjær Park is grounded in these two parallel histories, the area’s original landscape character, and its future role as a significant public open space located directly adjacent to Oslo’s Central Business District (CBD). The Landscape Plan for Brannskjær Park is also placed within a global context of transformed post-industrial waterfront sites, through a series of precedent projects. Pirrama Park in Sydney, Australia, and Iceland Wharf and sea baths in Copenhagen, Denmark, are both well-known projects that can help place Brannskjær Park in context with respect to widely recognised landscape and urban design principles relating to site programming and human-scale. One of the main principles behind the landscape plan is preservation and strengthening of the existing quay edge, which creates an important axis (sightline) between Hans Jægers Quarter and Bygdøy. This is achieved by relocating a section of reclaimed land, which today forms a distinctive isthmus to the south of the site. The removal and recloation on-site of this land mass allows for the creation of a new island (Nye Brannskjær) and canal as well as a new beach. The site’s endemic landscape character is, thereby, re-established in a series of islets by manipulating existing landscape features. The site currently has a 750m long water’s edge. LINK Landskap has developed an experience-based approach to cultivating a rich relationship between the park, its users and the fjord landscape at Filipstad. This focus on the creation of a landscape framework providing a series of unique experiential qualities will ensure Oslo’s inhabitants get a park that will live up to its role as Oslo’s most important publically accessible waterfront open space located directly adjacent to the CBD. The Landscape Plan retains two existing concrete quays, both as historic references and so as to ensure the maintenance of their maritime programmes on the site. Future ferry connections to the CBD and Oslo Fjord’s archipelago, in addition to selected moorings for historic ships, will ensure the site’s maritime character is celebrated well into the future. 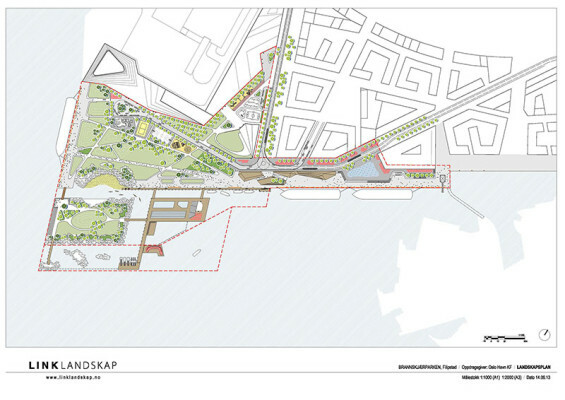 A harbourfront promenade and urban plaza will facilitate a connection between Filipstad’s new urban development areas and the Fjord. 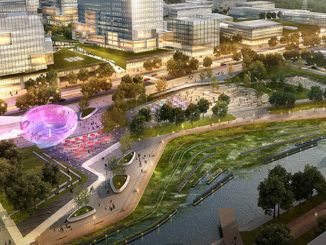 The design for the plaza activates important height differences by creating vibrant areas for public life by the water. 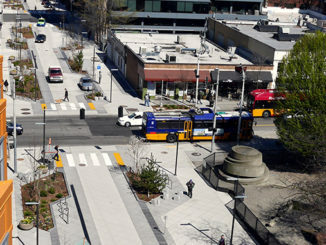 A large fountain will create a unique identity for the plaza as well as providing opportunities for water play. A new timber terrain located adjacent to the Harbourfront promenade will function as a mediating element, creating variation and interest in a zone of transition between city and fjord. This timber terrain will offer areas where people can safely sit, mingle and relax on raised planes with unhindered views out over the Fjord. 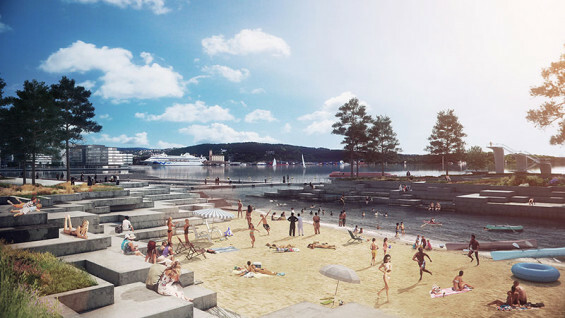 A network of new sea baths will offer new contact with the Fjord – right in the middle of the city centre! The sea baths will become an exciting destination in its own right during the summer months where people can bathe, swim laps, promenade, dive, sunbake and go snorkelling.